I started to learn French one year ago because I would like to communicate with my husband family in French. But as of now I can’t speak French at all, I can only understand easy words a little. When I listen to my husband and his mother talking, I always imagine what they are talking about. Most of the time my guess is wrong, but sometimes I can understand a few keywords and get the topic they are discussing. 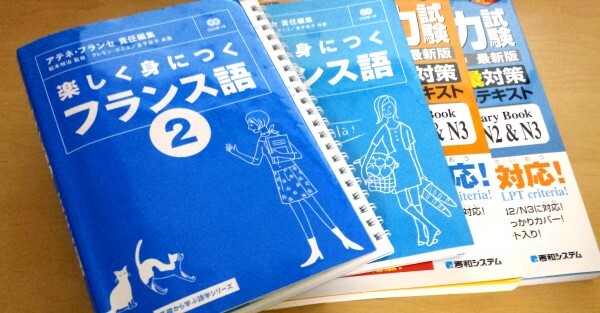 My problem is, I can’t keep on studying every day. Studying every day is really hard for me. After work, my energy completely vanishes and I don’t have any motivation to study. 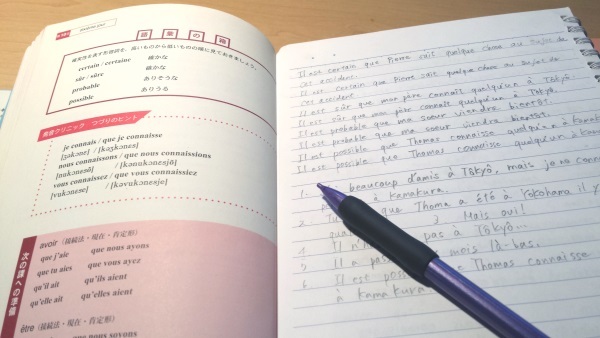 My husband and I often decide that “today we’ll only use Japanese”, as a Japanese study for him, but after a while, we just use English and completely forget to stick to Japanese. Also in the case of my study of French, I often try to talk to my husband in French and I try a few sentences that I learned that day and then usually we go back to speaking English. I understand that I should study every day and we should not use English in our conversation to master French. But I am quite lazy and I can’t force myself to use just French. Anyway, I still don’t have enough vocabulary to make conversational sentences so I am going to memorize basic and daily words at first. Mastering a language is a long way to go.